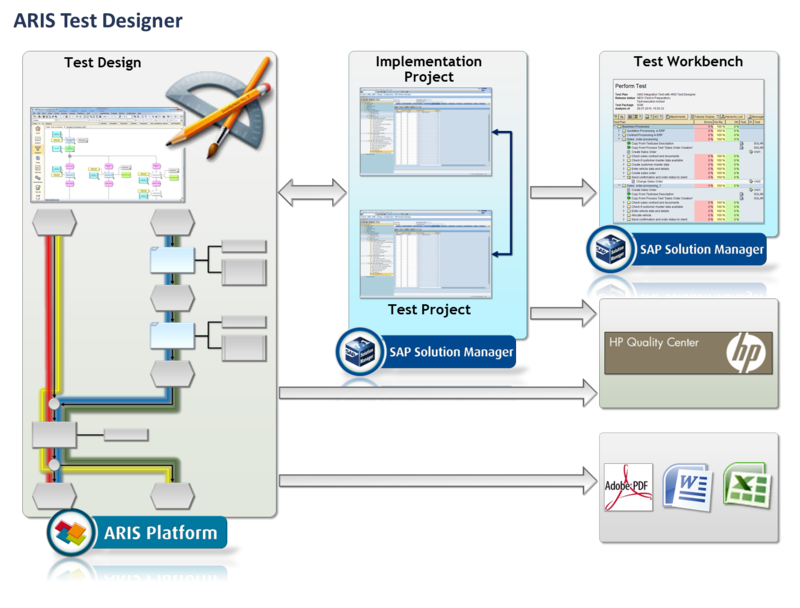 ARIS Test Designer as part of ARIS Business Architect for SAP is used to define integration tests based on the process models documented in ARIS. Going across the models, end-to-end processes are recorded and documented using an easy-to-use and intuitive graphical interface. This ensures, first of all, that the system actually corresponds to the designed business processes and the processes tested correspond to the processes implemented, which in turn helps to ensure quality in testing and implementation. Besides this recording, the related test-case documentation can be created including a graphical representation of the selected model path and all relevant information maintained in ARIS. Depending on the selected testing tool, these test cases can be transferred into SAP Solution Manager for test plan creation in the SAP Test Workbench or directly transferred into HP Quality Center or other testing environments to execute the testing. This ensures high-quality testing by good knowledge and documentation of all process ariations, the close collaboration between the end user and the IT project team as well as testing tools to partly automate this step and document the results properly. Using ARIS Test Designer thereby saves time re-using previously modeled processes, inimizes project risks and improves process and system quality. In addition, including the end user in the validation of process models and definition of test scenarios ensures high user acceptance and motivation. This in turn increases project success and delivery in time and quality.